Node40, a Blockchain governance company providing investors with an easy-to-generate and passive revenue stream, today announced a highly requested feature for Masternode owners, Masternode Portfolio Insight. 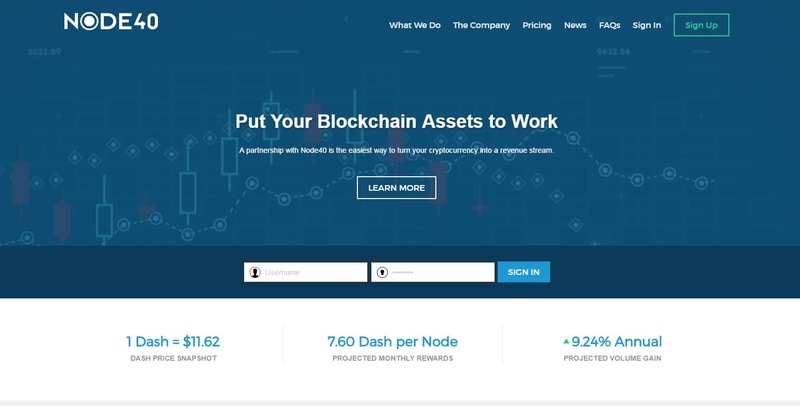 The feature is designed to showcase asset performance for every Node40 customer, all of whom are investors in the popular, stable cryptocurrency Dash, and is the first of its kind in the crypto community. Node40’s Masternode Portfolio Insight illustrates with precision how each Node performs fully tracked against the United States dollar on a monthly, quarterly and annual basis with upcoming support for real-time custom ranges. Moreover, the online reporting tool will show Masternode owners exactly how their cryptocurrency gains stack up against other traditional forms of investment such as property, savings account gains, or stock market returns. As a result, the tool is an important step in the path to mainstream Blockchain adoption. Node40’s new feature is accessible to customers via a recently rejuvenated and improved UI, showing users exactly how many network rewards have been received in a reporting period, how much value they’ve accrued in both Dash and USD, while tracking gains as well. The Masternode Portfolio Insight, which went live on October 9, was built by founders Perry Woodin and Sean Ryan for two reasons: first, the vast majority of masternode owners needed a layperson’s view of realized and unrealized value fluctuation pegged to fiat currency, and second, users needed a simple solution for end of fiscal year tax filing requirements. Node40 is gaining significant momentum due to the rising value of the world’s 7th most valuable cryptocurrency, Dash, which has quintupled in value from this time last year.